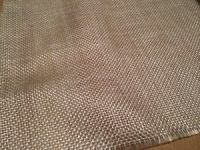 Glass Fabric Ecrou from 160 gr / mq VV-3036, this fabric due to its soft texture is designed to perform the first layers of the molds so as to avoid the use of various glass fabrics fini.Grazie to its softness is well suited to all forms and allows to avoid the gelcoat is "marked" by the fiber. It allows you to perform good thickness immediately. The fabric absorbs about 1.5 times its weight as quantities of resin.